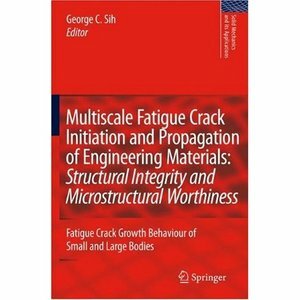 This book elucidates the correlation of fatigue crack growth data to multiscale cracking, particularly to the understanding of micrographs influenced by mechanical disturbance and thermodynamic variables. Attention is given to the interpretation of test data by fatigue crack growth rate using two empirical parameters in consistent with the fracture control methodology currently used by industry. Micrograph and crack growth rate data are presented for a host of metals used by the aerospace and nuclear industry. Furthermore, these data can be shown to lie on a straight line for the two parameter model that traditionally refers to regions I, II, and III. Results for small and large cracks can thus be connected to provide fatigue life prediction with data from the microscopic scale level such that the interactive effects of loading, geometry and material by mechanical tests are accounted for.